I’ve been thinking about things. Physical objects. How much I love particular tools and materials. A fragment of lace, one bead, my desk, a collection of postcards. Stuff. Being the well-intentioned child of socially conscious parents I recoil from defining myself as materialistic. However the more I think about it, the more I’m finding validity in the word. I do love this material world, and the way the physical can carry a story and preserve meaning. When I was little I played a game with myself. I would stare at my most cherished and familiar belongings, striving to make them unfamiliar. Something would pop and, rather like the description of switching from left to right brain in Drawing on the Right Side of the Brain, I would see my Teddy bear the way a stranger would, as a scuffed toy with a zipper across it’s back. I don’t want to play that game anymore. Instead I’d like to explore more deeply the relationships I have with objects. See what comes up. 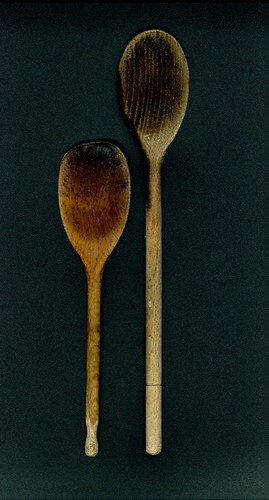 I love these two wooden spoons. The short one came to me in a batch of kitchen utensils when my ex’s grandmother moved into a home and distributed her belongings. It was already worn down on an angle from years of meals. The large spoon was brand new when I bought it. I was working in a kitchen supply store, and for a while I oiled it, the way you’re ‘supposed’ to. I like it better now that it’s dried out and stained. The burn down the left side just happened last week when I left it too close to the flame. Still works good. This entry was posted on Sunday, June 17th, 2007 at 3:42 pm	and is filed under a few of my favorite things, patterns & connections. You can follow any responses to this entry through the RSS 2.0 feed. You can leave a response, or trackback from your own site. Your valuing worn, used, loved possessions doesn’t seem to me to be materialistic. To be materialistic would imply a need to acquire more and more without valuing what you have. I love your worn spoons! when I was in elementary school we had to make a spoon in woodshop class, and I hated how new mine looked, compared to the lovely charred ones my parents had. The patina is what gives it character and shows you its life. i feel the same way about fabric. i am even collecting stains on fabric and i hope i can present them in some beautiful way. like your spoons. with a story. I am also fascinated by the idea of making the familiar seem new or strange. I usually do it with places that I travel through everyday. When I can do it completely it is a very alive-making feeling, somehow. I also love your spoons! I did something similar with words and concepts as a kid – I’d repeat the word or idea in my mind over and over and over until I lost familiarity with it. It was a meditative technique, a superpower, and a coping mechanism for me. Copyright 2007-2013, boodely. All rights reserved.